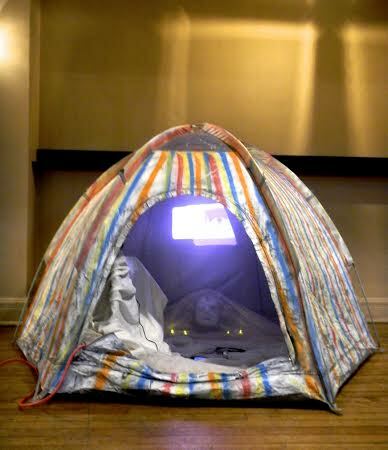 Description: PsXXYborg is the game art piece emerging from OCAD’s game:play lab, which employs feminist philosophy and feminist design ethics to collaboratively create an ongoing game project, which lives as a single player installation inside of a custom painted tent. The new technology, ScreenPerfect, which was designed as the game engine on which PsXXYborg would run, is a dual screen game platform, which allows players to navigate between many different video files as they choose their own adventure, in this case, to upload their consciousness into the Nous. Self contained inside of a 3-person tent, players enter one at a time to play, emergine once again from the PsXXYborg womb, reborn. Statement: PsXXYborg aims to create a critical player, one who is rewarded by going off path, to discover that the game is the same, no matter how unique one has been convinced they are by the capitalist agenda of individual creation methods, that drive the markets for the search of the unique and authentic. Presenting itself as a promise to acknowledge your ultimate personal value, by offering a way to upload your unique consciousness into the infinite digital ether, known for our purposes as the Nous, is a calling out of the Ray Kurzweil’s of the world, who seek immortality through a technological ascension they believe to be just around the corner (see: The Singularity is Near). PsXXYborg opens the doors to those pilgrims who seek to escape their human, fleshbased existence, and mount their true self, their consciousness, into a higher realm, which the body denies them access to.